Once I had my destination for the weekend ready for waze, I hit ukc for a quick search. We'd left the Peak Bouldering book in the depths of a backpack in a car, somewhere, so a combination of ukc and google earth secured my via point. I indulged in some gentle traversing and easy V grades on my own that afternoon. The rock felt fantastic, up high on an escarpment I engulfed the panoramic surroundings. The silence in the air, the cool breeze, it all washed away earlier commuting stress. Sometimes it's easy to get wound up thinking that you need to go on doing what you don't like doing, to keep doing the things that you don't like doing. A combination of thoughts from words learnt from Alan Watts and Ram Dass took my ascents into very conscious places. I guess the idea of being free is kinda real, but you've got to want to leave all the superficial daily grind behind to get there. Climbing is my easiest liberation, from the first reach my thoughts are silenced and it's just the rock and I.
Seventies existentialism aside, when I got to our little B&B I was so on for a day of walking ahead. Motorway traffic allowed the rest of our awesome team to trickle through, Emma and I sensibly hydrated on Pinot Gregio in the sunshine to start things off. After a perfect evening in the little town of Castleton we hit the sack ready for our mountain challenge. Waking up, booting up, packing the day sacks, there was a pre race feeling stirring around. 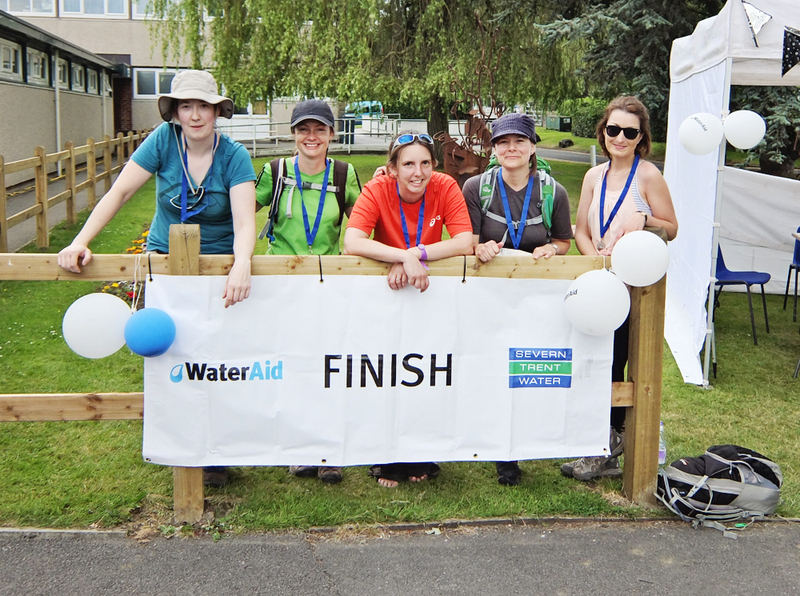 We signed up to the Severn Trent Water Mountain Challenge for Water Aid. Practice hikes demonstrated our teams strengths, but the clock was ticking and we wanted to see how we could do. Pre Pinot Gregio the night before, we thought about marking up a route, well, the thought was there... But we excelled on the hoof, kinda. With humidity increasing per stride, my skin gushed with sweat. As the salty liquid pooled on my skin I thought about how amazing it is that we developed our abilities to sweat. How through sweating we became these strong and powerful endurance creatures. We were able to track great distances and venture into territories where our hunting abilities provided our only survival. If our ancestors could do it to survive, we had every great chance to succeed in a timed completion. At the sixteen mile mark we checked in at one of the marker stations, they had snacks and juice out for the walkers. I was well hydrated and had awesome complex carbs packed so passed. However, with storm clouds looming in the skyline, the final four miles seemed like a very far stretch. "Coffee, ladies?" One of the volunteers asked, in her hand was a tin of fair trade microground. I squealed something that seemed to suggest yes and in no time had delicious caffeine feeding my addiction. This gave that perfect second wind, and in what seemed like no time at all, we had reached our final 540m peak. From there, it really was downhill and we were the "Girls on Top!" Maybe the rose tinted glasses are on, but I'm stoked for the next one!